Artisan has a special built in item that should be used when selling a Gift Card or Gift Certificate referred to from now on as GC. There are a number of configuration settings for the GC, you can find more information in the Tutorial – Configuration Settings for First Time Setup. Once you have your GC configured to your specifications you can then begin selling them. Enter the item code GC into the sales screen. Enter the value of the GC into the Price field. 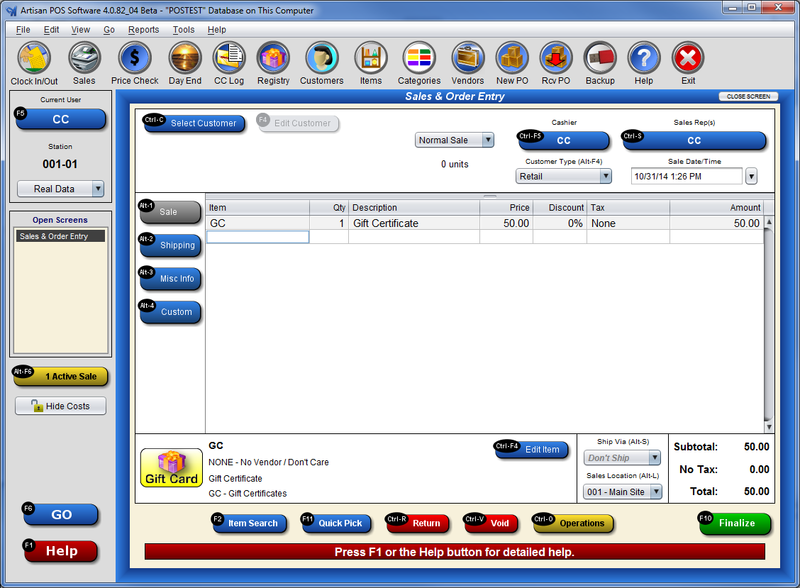 You can sell multiple GC or other items on the same transaction. Finalize the transaction and complete any prompts that you may have turned on while configuring the GC, for example Recipient Name and/or GC number. The GC is now recorded in the system. You can find the list of outstanding GC’s by going to Accounting=>Credits, Coupons & Gift Cards=>Gift Cards (Gift Certificates).